CD slot mounts are a great way to breathe life into what is, for many of us, a neglected part of our car. Depending on your vehicle's layout, these accessories stick smartphones where they're easy to see and very accessible, both for the driver and a passenger. 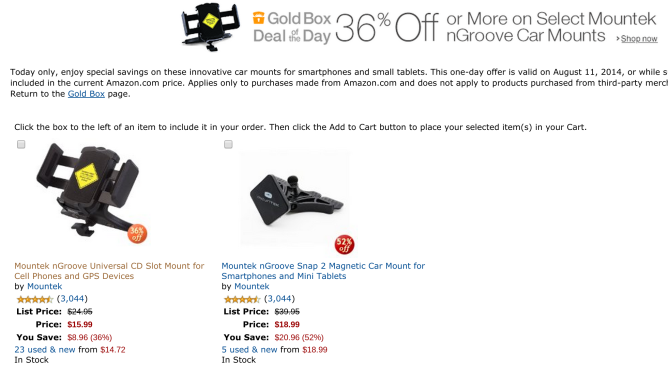 Today two of Mountek's CD slot mounts are available as Gold Box deals. The nGroove Universal grip CD slot mount is going for $15.99, while the nGroove Snap 2 magnetic car mount goes for $18.99. For a better look at how this kind of thing works, take a gander at our Satechi CD slot mount review. Some of you recommended Mountek's products in previous comments as a great alternative, and now we're doing our part to pass the information along. Hit up the links below for more information on both products.